Probably the most famous of the “lost rivers” under London is the river Fleet, an increasingly polluted river through the City which was slowly buried to hide its contents from surface dwelling folk as its contents became increasingly putrid. I have previously transcribed an excerpt from the Illustrated London News of how the Fleet Sewer was enlarged in 1845, and now I have a later article from 1854 of how another section, closer to the river, was being repaired. Quite interestingly, the article goes into quite a bit of detail – as was common for newspapers of the time – in giving a break down of how the sewer runs from Hampstead down to the Thames. The ubiquitous Diamond Geezer mapped out the line of the sewer from above in 2005, and I now present an article about the same, from 1854. The passenger who rolls smoothly over the well-paved roadway, or hurriedly elbows his way through the dense mass of human beings which throng the foot-pavements of this huge metropolis, rarely thinks of the vast reticulation of subterranean channels by which are removed the liquid refuse of the millions inhabiting the banks of the Thames. Yet, when it is considered that, during dry weather, the aggregate liquid refuse of the metropolitan population, contributed by hundreds of thousands of inlets and minute drains, amounting to about 14,000,000 cubic feet, or 87,000,000 gallons daily, is discharged by sewers, and, for the most part, without inconvenience of any kind, their importance becomes at once apparent. But this is their dry weather discharge. In times of rain, the utility of the sewers, although, perhaps, not greater, is more striking. The area of the metropolis, according to the boundary of the Registrar-General, is about 112 square miles – the more closely populated portion may, perhaps, be taken at about 60 square miles; and, if we assume a rain of about half an inch in depth equally over the whole of the latter area in twenty-four hours (a rate of fall no unusual), then, during the considerable portion of the time, in addition to the sewage from the houses, a quantity of water of about 18,000,000 gallons per hour, is discharged by the London sewers. Storms even of half an inch of rain during the hour are of yearly occurrence; and even of two inches in an hour, are within the memory of most men; yet the water of the severest storms is, for the most part, received and carried off by the sewers without injury or inconvenience, and, with exceptional cases, almost immediately; and, at the furthest, within half an hour afterwards, but slight traces of the storms are left. When the great length, the inevitable intricacy of this vast system of subterranean channels is considered, the Sewers of London, which have been plentifully abuses of late years, must, with all their faults, take their place among the wonders of this leviathan city; and fully justify the assertion made by the most eminent engineers, that London is the best-drained city in the world. One of the oldest Sewers, if not actually the oldest, in the metropolis, is the Fleet; once an open river, which, as Stow tells us, “had been of such breadth and depth, that ten or twelve ships’ navies at once, with merchandise, were wont to come to the aforesaid bridge of Fleet” – is still a river, although hidden from sight; the waters of the Highgate and Hampstead hills still run through it; the old Bourne (now also a sewer) still delivers its waters into it; but, in addition to this, from running through a dense population, it probably received and discharges more sewage water than any other sewer in the metropolis. The Corporation of London early saw the propriety of covering over the open water-courses, which in the process of time, had become open ditches of sewers. The Fleet, north of Fleet-bridge, was covered in when Fleet-market was built; the portion north of Holborn was covered in about eighteen years ago, it being the last open sewer within the city boundary: above the City, the Fleet is, however, in portions still open. The sizes of this vast arterial drain are as follows:- Near Blackfriars-bridge, it is about 16 feet high and 12 feet wide; in Farringdon-street, the sewer is divided into two branches, each being about 11 feet 6 inches high and 6 feet wide, which join at Holborn-bridge, and connect with a sewer about 12 feet high and 11 feet 6 inches wide. That portion of the Fleet Sewer which lies south of Fleet Street is now under repair. 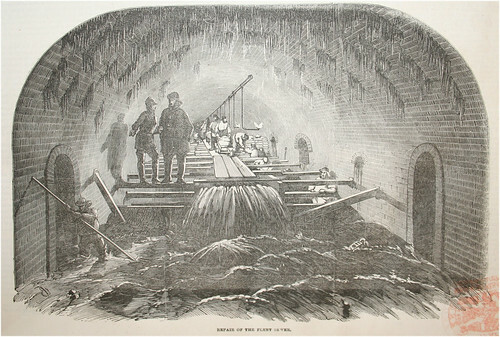 Our Sketch will give some idea of the extent of the work, and the extreme mechanical difficulties that have to be contended with in carrying it on in such a situation; the only opening to it, as was reported by the engineer to the City Commissioners of Sewers, being but three feet square, and the dewer itself always running vast quantities of water, subject to tidal influence; and, in times of rain, its current being swollen to a vast torrent, capable of carrying almost everything before it; the rain-water of between seven and eight square miles being carried off by this sewer. The works are being executed under the direction of Mr. W Haywood, the Engineer to the Commission; Messrs. Thomas Crook and Son, being the contractors for the work. We subjoin a few details of the Fleet, as a river:- The small rapid stream Fleet, which has given name to the prison and street, and the portion of the City Wall ditch from Holborn to the Thames, has its origin in a nursery-ground on the eastern ridge of Hampstead-hill. Here is becomes a sewer; after which it issues from the side of a bank below Well-walk; and then flows down a small valley of gardens and orchards to near the reservoir of the Hampstead water-heads, to feed which the springs of the Fleet were collected in 1589, and were afterwards leased out by the City of London. From Hampstead the Fleet may be traced to the upper part of Kentish-town; after which it is diverted from its original course for the sewage of Camden-town; but its ancient channel may be traced at the back of the Castle Tavern, Kentish-town, and next in the King’s-road, near Pancras Workhouse; and about 1825 the Fleet was conspicuous all along the Bagnigge-wells-road, but is now covered over. Its further course is under the walls of the House of Correction, in Clekenwell-fields, thence to the workhouse in Coppince-row, under Eyre-street (formerly Hockley-in-the-Hole), having here been originally joined by “the River of the Wells,” formed by Clerken, Skinners’, and other wells; and thus to the bottom of Holborn. 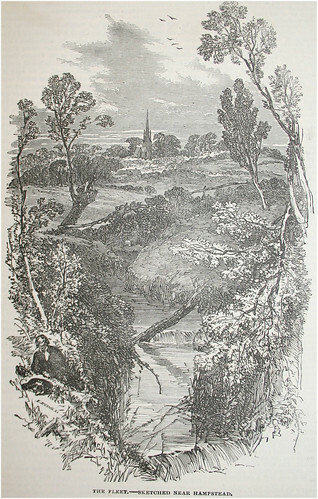 Here is received the waters of the Old Bourne, which rose near Middle-row, and the channel of which forms the sewer of Holborn-hill to this day. Then the united stream flowed beneath what is now called Farringdon-street into the Thames. 2 Pings/Trackbacks for "Repairing the Fleet Sewer"